How do you know if you have understood a concept clearly? How do you know if you have defined a goal clearly? 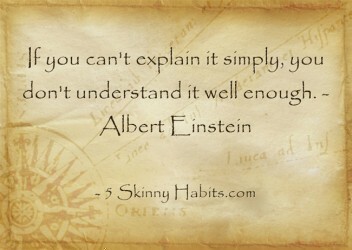 Einstein gives the following insight: If you can’t explain it simply, you don’t understand it well enough. The same applies to goals or mission statements. If you can’t explain it clearly and simply, it is not a clearly defined. This seems more obvious than it is. Try it on a friend! Explain a concept, goal or mission statement. Based on their response, you will know if YOU have understood it properly.